We had almost 1.1K Backers and Bots in our small instance at one time. Larger than a typical “battleground” but nowhere as big as a zone, the play space held a lot of real and imitation (our bots look the same to the build as real players: they are not NPCs in the usual sense) players, with nary a hiccup. Our use of PhysX on the server-side continues to pay off. Physics continued to work well, and we’re going to keep tweaking it to add more and more to the system. I believe Rob is working on what happens when one of our Big Blue Beef players runs smack into a Luchorpán. Fun ensues—well, at least for one of them. C.U.B.E. 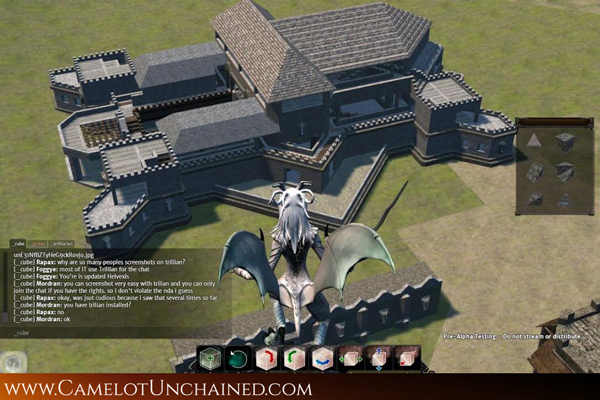 (Camelot Unchained Building Environment) worked as expected, and was a great surprise to many of our Alpha Backers. Since we put it up, our Backers have spent thousands of hours on new creations (I’ve attached another early CUBE building to this email). We got some great gameplay captured on video, and we are editing it into a movie right now. Pretty decent stuff for a Tech Alpha, and it’s just going to get better from here. Now, at this point I could get all hype-tastic about (1) and (2), but I’ll simply say that what our Alpha folks are playing in is our old-school Tech Alpha. To be able to support that many Backers and Bots, with nary a lag spike, no crashes, and high framerate on the vast majority of rigs, speaks volumes on how well we did pretty well for our first Alpha test. Our IT folks can tell you that we made a lot of big improvements over the last few weeks preceding Alpha. I hope everybody out there is as happy as we are! 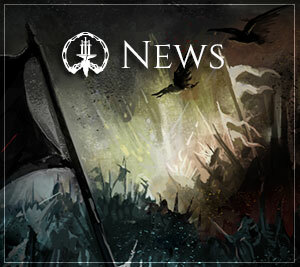 Our French site has been updated and you can find it here at http://camelotunchained.com/fr_v2/. In honor of our French Backers, Sandra has created a special duck for them. As always, thanks to our great French Backers for their help and support, not only in getting this site online, but for their long-time support of Camelot Unchained™ and some of my other games! Much appreciated. We passed another milestone (the good kinds of stones you can pass), and met another Stretch Goal. Hug The World was one of the fastest SGs we have ever unlocked, and thanks to you, we’ll be able to hire a full-time environmental artist. As of this writing, we are about to ink the first intern for this SG, one that we hope will also turn into another artist for the team. As part of this Stretch Goal, all future SGs will come with extra stuff for all of our Backers. These will not be separate Founder and Builder rewards, but rewards that will go to all of our then-current Backers. So, if you backed the game prior to us achieving the Stretch Goal, you will get the reward. And here’s a special note for our Builders. During the Kickstarter, our Founders were able to gain additional rewards as we hit Stretch Goals during the KS. Well, as our Builders’ contributions have continued to climb, they should also be rewarded, and they will, in the coming months. I’ll be posting more information about this in a week or two. For another piece of art today, we have a neat building constructed by one of our Backers (Rapax). Pretty fine piece of work, considering the current early state of C.U.B.E. Pretty sweet, eh? And it’s just going to get better from here. Next week is going to be a short week for the studio, as I’m giving the team a few days off after the extra-special effort to get us into Alpha. So, CSE will be closed from Monday, March 16th – Weds., March 18th. That means email won’t get answered, and our support on the Forums will be minimal. As some of us scatter to other parts of the country, I’m going to be among them. My destination is, once again, the Oregon Coast! So, if you happen to be in Portland, Oregon, or its environs, and would like to meet with me and my family, I’m thinking that I’d love to have a get-together on Sunday, March 15th in the late morning/early afternoon. So, if you are interested in getting together, head over to our Forums, where we are going to coordinate a possible get-together. It’s been a great couple of weeks for the studio. Busy, of course, but great. We really couldn’t be more pleased with where we are at, right now. And, in the “good news” department, we’re getting some additional programming support, albeit part-time, for the next few months. It’s not a game-changer, but it’s a start. 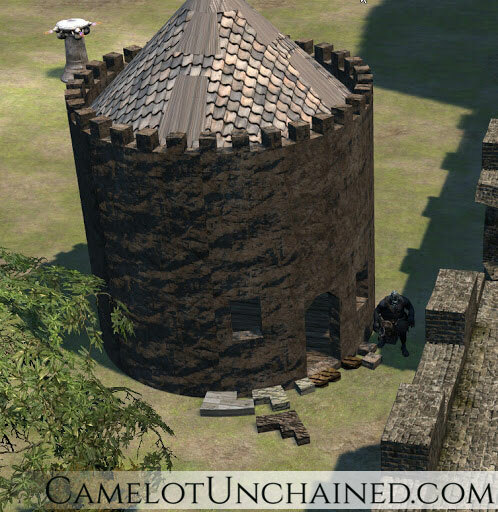 As always, thanks for the support, patience, and for helping to make Camelot Unchained a reality! P.S. 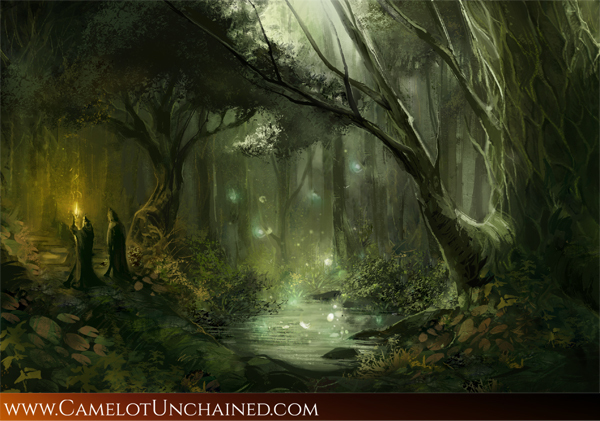 Here’s a nice piece of bonus art from Michelle! It’s an improved version of her forest scene that she was working on during her live streaming.